The long road to replacing the Air Force's aging fighter jets took another turn Wednesday, as the Liberal government announced it will consult with industry to determine the best new aircraft for Canada. 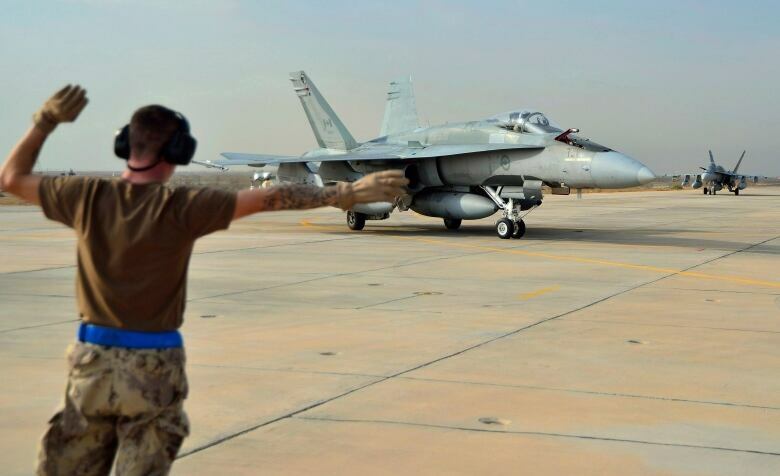 The move, announced by Defence Minister Harjit Sajjan in a speech to industry representatives, comes after reports last month that the Liberals were considering buying Boeing Super Hornet fighter jets without a competition. Baloney Meter: Is there a capability gap when it comes to fighter jets? Sajjan said no decision on a new fighter has been made. Rather, officials from National Defence and other federal departments will sit down with fighter jet manufacturers through the summer to determine what they can offer. "Officials will seek up-to-date information from leading manufacturers on key issues, including cost, economic benefits for Canada, and their ability to deliver planes quickly," he said. "That information will inform a decision on a procurement path in the coming months." The government also intends to consult with allies about their experiences using various aircraft. It's not the first time the government has held such consultations. The Conservatives launched a similar exercise in December 2012 as it pressed pause on its plans to purchase the F-35 stealth fighter. Those consultations, which were overseen by an independent panel, included a fulsome assessment of what Canada needs in a new fighter jet, and what options were available. The final report, released in December 2014, came out favourably for the F-35. Critics, however, said such consultations could not replace an open competition as there was no way to fully test each company's claims. Sajjan did not say whether there will be any independent oversight over the consultations. He also refused to say whether the Liberal government still intends to hold a fighter jet competition, as it promised during last year's election campaign. "No decision has been made, and right now myself and my department are working diligently to making sure that we have all the necessary information so that a decision can be made to move forward," he told reporters before his speech to industry representatives. The minister also didn't say when an actual decision on a new fighter will be made. However, Sajjan did emphasize the need to replace the Royal Canadian Air Force's 77 CF-18s quickly. Only about half the fleet is available for operations at any given time, he said, which is not enough to meet Canada's commitments to NATO and North American defence. "Today, the number of mission-ready aircraft we can deploy on an average day is actually less than the number of planes we are committed to have ready," he said. "The capability gap will get worse in the years ahead as CF-18s must be taken out of service." Critics have previously questioned such assertions, pointing to Air Force commander Lt.-Gen. Michael Hood's testimony before the Commons defence committee in April as proof the Liberals have manufactured a crisis. Hood said the CF-18 fleet should be able to operate through 2025 thanks to a $500-million upgrade ordered by the Conservatives in 2014. Twenty-six out of the 77 fighters have already undergone structural work to fly through the mid-2020s, and electronic upgrades are planned. Sajjan, however, said even with the upgrades, Canada will be hard-pressed in a few years just to defend North America with the U.S. unless new aircraft are delivered. At the same time, the shortage means Canada isn't able to contribute to other, non-NATO missions. The Liberals promised during last year's election that they would hold an open competition to replace the CF-18s. But they also promised not to buy the F-35. This created a potential legal situation if the government was seen to discriminate against the stealth fighter. The F-35 has previously won competitions in South Korea, Japan and Denmark.